After 13 days, 11 clues and a lot of re-Tweets, search-savvy Twitter user Michael found the correct book in our first great Biblio Book Hunt: a rare copy of W.H. 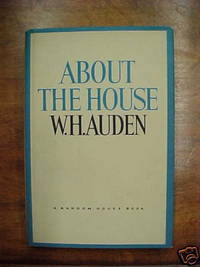 Auden’s About the House. The rules for the Twitter-exclusive Book Hunt were simple: we picked a rare book and posted a clue about it each day. With each day the clues got more and more specific, and they were saved for a short time under the search #bbh for folks who stepped into the game after it started on May 27th. First person to reply to us on Twitter with the correct title, author and URL was declared the winner, and received a $200 BiblioBucks gift certificate to our site. It was a great game, and we got a lot of feedback for the next one, which may be hosted exclusively for our Facebook fans. Want to play the next one? Simply follow us on Twitter, and join our page on Facebook. And thanks again to everyone who participated in the first Biblio Book Hunt! UPDATE (June 9, 2009): Sorry folks, but the Auden book has been SOLD. The first lucky winner of the Book Hunt, Michael, purchased that very copy as an addition to his collection!